Jacks Crafts handmade gifts personalize your family name. We now offer Family Name Engraving on wood. Here at JacksCrafts.com you can have a wonderful gift handmade for yourself, your family and friends. 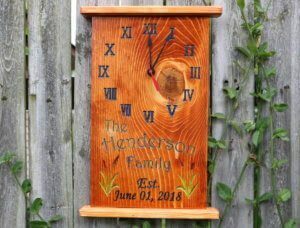 If you are looking for a unique gift for someone special in your life, my hand crafted family name signs and clocks are a great choice. When you order a personalized gift with someone’s Name right on it you are showing this person that you really were thinking of them. That this gift was especially made by hand just for them. It gets a little tiresome fighting off the scammers and robots so I decided it is best to just let the professionals weed out all those trouble makers. This way I will have more time to design new items. Everything at Jacks Crafts is made by hand right here in the United States of America, in my home town of Muncie, Indiana birth place of Ball canning jars. Timber is usually classified as either hardwood, from broad leafed trees like beech and oak, or softwood from conifers like pine and fir. Simply because they’re replaceable, fast-growing species like pine trees tend to be more sustainable than slow-growing trees like oak. So we use pine for our art projects. I never use MDF it just isn’t real wood to me. 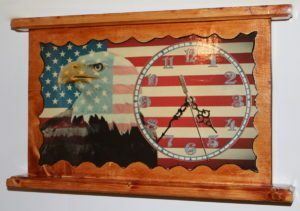 I make my clocks and plaques or signs to last for many years to come. I design the signs and clock faces on the computer then print them out. For an aged look I then burn in the border with a Candle around the edge before I mount the sign onto 3/4 inch thick wood. I then stain the wood and coat the entire project with several coats of Minwax for long lasting protection. You can say anything you like. Hey I am an American so I believe in free speech. So the message you want to convey is totally up to you. 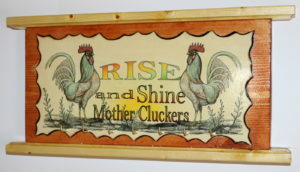 I like to make people smile so I try to say something funny like my sign that says “Rise and Shine Mother Cluckers – Rooster” But you can say whatever you feel. For instance: May God’s Grace and Love Watch over you always. Or you may want to say I love you grandma, grandpa, mom, dad or Betty Joe, Bobby Joe and Billy Joe. Maybe you want to let the world know that you are Junior Samples love child and wife. The possibilities are only limited to your imagination. 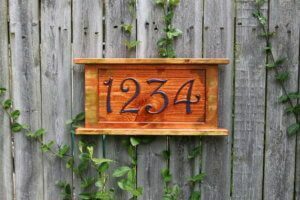 Family name Clocks and signs with their Established Date are an excellent choice. Add your personal message FREE of charge. That’s right, we do not charge extra for the YOUR NAME HERE! So you can choose what ever personal message you like and there will not be any additional charges. You can say “Hi Bill” or if you rather say “Hello William Happy 50th Anniversary” it is still free. We now have a craft shop on Amazon HANDMADE. To visit us on amazon just follow this link. See some examples of my work. Here you can weigh things out before you go shopping.